Your health can only be as good as the food you eat and following a regular diet based firmly on nutrient rich, organic food is one of the best things you can do to age gracefully. Supplying your body with vitamins, minerals, proteins, healthy fatty acids like Omega-3s, and antioxidants is critical to a healthy life. You might not guess it, but pecans are actually one of the best foods for accomplishing that goal. As you age, industrial and natural environmental toxins like radon, lead, and arsenic attack your body and make it harder for it to repair itself and protect against ailments. When you combine this with processed, refined foods loaded with sugar, unnatural chemicals like high fructose corn syrup (HFCS), aspartame, soy lecithin, and hormone disruptors, the assault on the cells in your body becomes crystal clear. A study from Brigham Young University found that antioxidants protected the eyes and reduced the risk of age-related macular degeneration. One of the researchers commented, "The implication is that people at risk of macular degeneration could help prevent the disease by consuming antioxidants." Simply put, consuming foods rich in antioxidants may help you be protected against degenerative conditions. Pecans are an incredible source of antioxidants. One of the highest, in fact, according to the USDA. Ninety percent of a pecan's antioxidants come in the form of beta-sitosterol, a plant chemical with powerful antioxidant properties that protects low-density lipoprotein (LDL) cholesterol from oxidizing and damaging the arteries. Pecans are also a rich source of vitamin E, which compounds the antioxidant benefits. Pecans support the heart in other ways too. They promote normal blood pressure, help with weight loss, and help keep blood sugar under control. These foods are a great source of nutrients that promote graceful aging. Omega-3 fats fit into the this category of mono- and polyunsaturated fatty acids. The densest sources of these healthy fats are fish like salmon, avocados, and flax seeds. You know you need vitamins like A, the B-complex, C, D, E and K. To get these you need to eat natural, organic foods. These contain forms of vitamins your body can readily use, unlike processed foods that contain artificial vitamins. The same goes for minerals like magnesium and calcium. In fact, magnesium is responsible for more than 300 processes throughout your body. Great sources for combined vitamins and minerals include dark leafy greens, broccoli, beans, cheese, whole grains and dark chocolate. Foods like yogurt and kefir provide you with 'friendly' gut bacteria that support immune function, toxin removal, and supply important vitamins like B12. When you buy probiotics, make sure they contain live, active cultures. If they don't, you'll be missing some of the key health benefits that such foods boast. Fruits and vegetables provide fiber–or prebiotics–and types of sugars that feed your friendly probiotic bacteria, keep them healthy. Fruits like blueberries, raspberries, cruciferous veggies like broccoli and Brussels sprouts, and green tea are known for their antioxidants. Rich in antioxidants, raw, organic pecans are also a complete source of vitamins, minerals, fatty acids, protein, and fiber. And they're easy to eat! Grab a handful as a snack or add them to your favorite dish to add texture and enhance the meal with a rich nutty flavor. Just remember to buy raw and organic. The fats in nuts like pecans soak up pesticides and herbicides more than other fruits and vegetables. Besides munching on healthy foods like pecans, what do you do to maintain a healthy body and mind? Tell us in the comments below. We always enjoy hearing from you! Assmann KE, Andreeva VA, Jeandel C, Hercberg S, Galan P, Kesse-Guyot E. Healthy Aging 5 Years After a Period of Daily Supplementation With Antioxidant Nutrients: A Post Hoc Analysis of the French Randomized Trial SU.VI.MAX. Am J Epidemiol. 2015 Oct 15;182(8):694-704. doi: 10.1093/aje/kwv105. 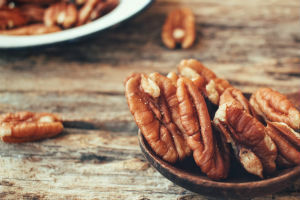 The post Best Anti-Aging Foods: Health Benefits of Pecans appeared first on Dr. Group's Natural Health & Organic Living Blog.